The premise is deceptively familiar: a family sitcom about a couple of parents trying to raise their three young children. But Outnumbered is far more than the premise suggests. It's a family sitcom that manages to capture family life more authentically — and more hilariously — than any other. Imagine Modern Family if it were the funniest show on television, and without the Hollywood gloss. The key is the kids. Ramona Marquez, who plays the youngest, was only 5 years old when the show started. The boys were about 7 and 10. Creators Andy Hamilton and Guy Jenkin wanted to find a way to make a family sitcom that didn't follow the usual conventions. "We both felt that TV hadn't really done a proper family comedy," Hamilton said, "in the sense that there wasn't one that had captured the chaos of life with small children." "You rarely get the feeling that children in sitcoms are real," Jenkins agreed. "They tend to be the same type of character — the smartarse who says adult things — and they are rooted to the spot, staring at the camera, because they've been told to stand in one place and say the lines. We decided to attempt to do something that hadn't been tried before..."
So, in order to capture the chaos of family life, only the adults got a copy of the script. The kids were left to improvise. 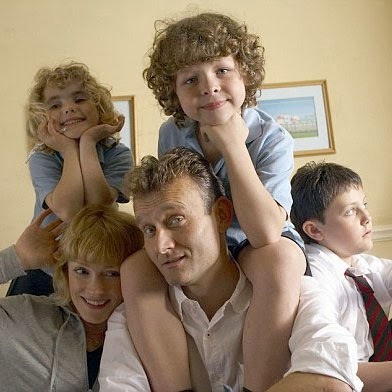 "You feel that the things that happen at home with your own children — and the things they say — are in some way funnier than the scripted things that children are required to say," Hugh Dennis, who plays the father, once explained. "But if you actually just let children be children, then it's funny — and I think that's the secret of it, really." And it worked. The kids' performances on Outnumbered are quite possibly the best performances by any children in any sitcom ever. It's no wonder all three quickly earned nominations for Best Newcomer at the British Comedy Awards. And since the parents don't always know what's coming, their performances feel more real and spontaneous, too. Dennis and Claire Skinner (who you may also know as the mother from Doctor Who's "The Doctor, The Widow & The Wardrobe" Christmas special) are both brilliant. It's been 7 years and 5 seasons since the show premiered. The kids have nearly grown up now; they've moved in and out of phases, developed new interests, matured. So the fifth season will be the last for the show. The finale airs tonight. It will mark the end of a remarkable run for one of the greatest British sitcoms ever.